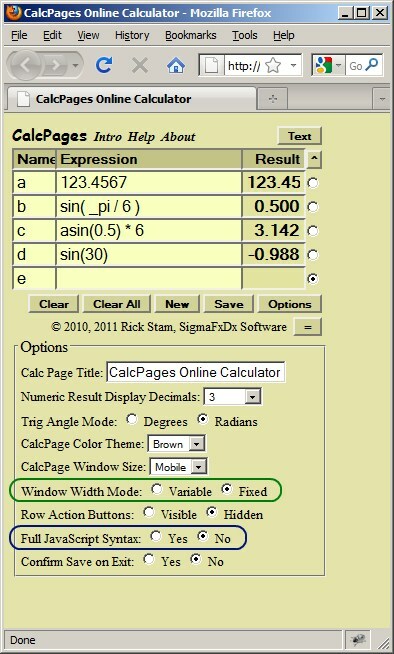 To show and hide the Calc Pages Options, click the "Options"
default file name when saving the page to your local drive. the number of decimals to use when displaying calculation results. You can select options between 0 and 8 or "Float" for floating point. trigonometry functions (sin, cos, tan, asin, acos, atan). 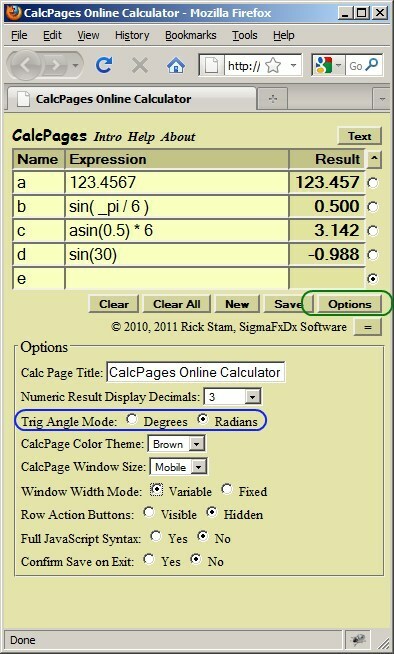 CalcPage Color Theme: Selects a color palette for the CalcPage. supports this functionality; Chrome does not). hide the Row Action Buttons row with the "^" button. on if you accidentally instruct the browser to go to a different page. constant, even when the browser window is resized. be removed in the near future if it is not needed. mobile devices often capitalize the first letter when entering text).